Smartphones play a significant role in our day to day life from being our personal assistant to a substitute to desktop computer they are now everywhere. The scope of mobile usage is increasing and with this mobile security threats and related issues are also growing rapidly. Like computer threats, mobile malware is also becoming prevalent and is a grave issue for both users and organization. When we say mobile threats, it means threats associated to wearables, tablets, and others also. All these devices have our confidential and classified information stored that need to be protected from malware attacks. But we can protect them only when we have knowledge about how these threats spread and what they are. Here we look at mobile threats you need to know and what the future holds. Are the most common and easiest means to spread infections and to gain access to mobile device. Often, users make the mistake of installing apps from untrusted or third-party sources that lead into download of malicious applications. Therefore, to stay protected users need to pay attention to what they are downloading and to the permissions they grant. Besides, they should always download an application from trusted source as Google Play Store or Apple App Store. If they are unable to find an app on these sources they should avoid downloading such apps or if downloaded should uninstall with immediate effect. Malicious mobile applications are the most common threat you need to know, as it contains malware, trojan that make changes to the device without user’s knowledge. Also, they collect, store, or share confidential information. Mobile bot is like computer bot, they add each infected device to a network of bots thus creating botnets. A botmaster controls all these botnets to infect a device by sending malicious emails, downloading malicious applications and various other sources. If you don’t have an anti-virus application running on your device, the risk of your device being infected by these botnets increases. Once a bot installs in your mobile device it starts to gain access to other infected device to create a chain. Mobile bots can lead to frauds, DDoS, data leakage and more severe attacks. If you think your mobile device cannot be a victim to ransomware then you are wrong. Ransomware is not just confined to desktop or laptop they are the fastest growing security threat for your mobile devices. Ransomware in mobile encrypts data and demands money to unlock the data. To avoid being a victim to ransomware always keep your device updated and never overlook software or OS update. 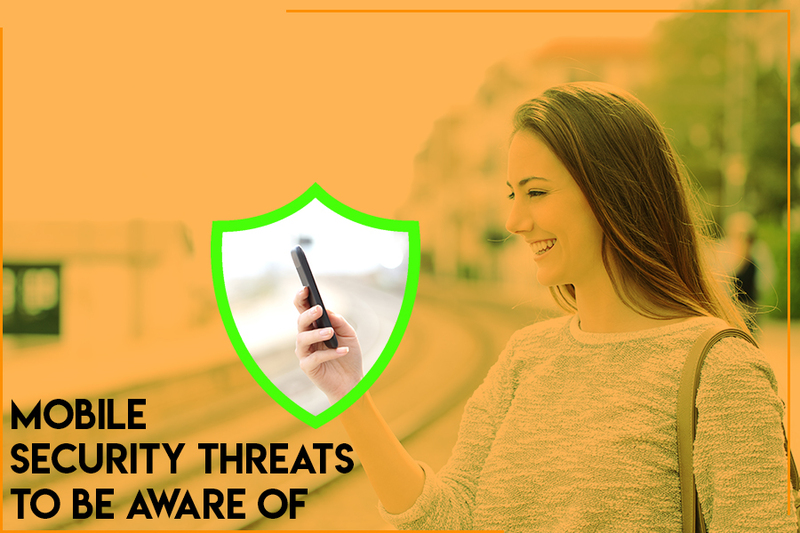 Also Read : Common Mobile Security Threats and How to Protect Yourself? The most common and traditional way of security breach is phishing attacks. It works on both desktop and mobile devices. Cyber criminals corrupt the device by sending malware as an attachment in an email or even SMS. It is the most effective means of collecting information also as mobile devices are always in use they are most preferred now a days to spread infection as compared to PC. Ad and click frauds are form of phishing attacks therefore avoid clicking on links received from untrusted sender. Also, make it a point to check sender’s e mail id before opening the email and downloading the attachment. Often in first look the email might look genuine but users need to have a suspicious eye to secure themselves from any fake email. With Internet of Things becoming popular, malware is also evolving, and it is poses a serious threat to mobile threats. Smartphone control most connected devices this makes mobile devices vulnerable and intruders can easily corrupt the device. Therefore, to stay secure we should disable Bluetooth when not in use and users should monitor background running applications, data usage. If they notice any activity that is different than regular, one should disconnect it and run an antivirus to detect if there are any infections. Till now we have only discussed about malware but there is another threat that is closer to you than you think i.e. Spyware. In many cases co-worker, employers, spouse install a spyware on your mobile device to keep a check on your and track your whereabouts. To stay secure from them you need to install and run an updated antivirus that can detect and eliminate these program that collect your data by spying on you. When app developers use weak encryption algorithm to speed up development process they know they are motivating attackers as the app is vulnerable to being attacked. Due to these flaws left in the code attackers get chances to modify app functions. To ease mobile device transactions, some apps use “tokens,” thus allowing users to perform multiple actions without requiring to re-confirm their individuality. Due to this attackers get a chance to imitate as legitimate user and make transactions. Desktops and laptop connected to mobile networks are responsible for infecting your smartphone, tablet. Therefore, you need to pay attention to the devices you connect to your so that you can secure your mobile device. Bring your own device (BYOD) policy of permitting employees to bring their devices to the workplace is opening gateway for hackers to get into your system. All the devices that you use don’t have same level of security as the desktops. Therefore, when you allow your smartphones to access organization network you need to be sure that they aren’t infected. The Internet of Things (IoT) with the growing number of interconnected devices/appliances—the threat of being attacked is also mounting. Hackers are using these devices as an entry point to get into your mobile devices, therefore to secure your mobile device you need to connect to lesser number of devices. This all clearly shows increasing number of mobile device security threats. To protect your devices and data users need to understand common threat vectors and need to be prepared for upcoming threats and next generation of malicious attacks.